Hieronymus Bosch (c 1450–1516), The Garden of Earthly Delights (centre panel, detail) (c 1495-1505), oil on oak panel, central panel 190 × 175 cm, each wing 187.5 × 76.5 cm, Museo Nacional del Prado, Madrid. Wikimedia Commons. Exactly five hundred years ago today, in Saint John’s Church in the North Brabant city of ‘s-Hertogenbosch (now generally known as Den Bosch in the Netherlands), the widow, family, and friends of Jheronimus van Aken commemorated his death. We know him as Hieronymus Bosch, creator of some of the most original, imaginative, and fantastic masterpieces in the entire history of western art. I recently gave an account of the little that we know of his life, and have written a series of articles detailing each of his surviving paintings: a complete illustrated index is here. 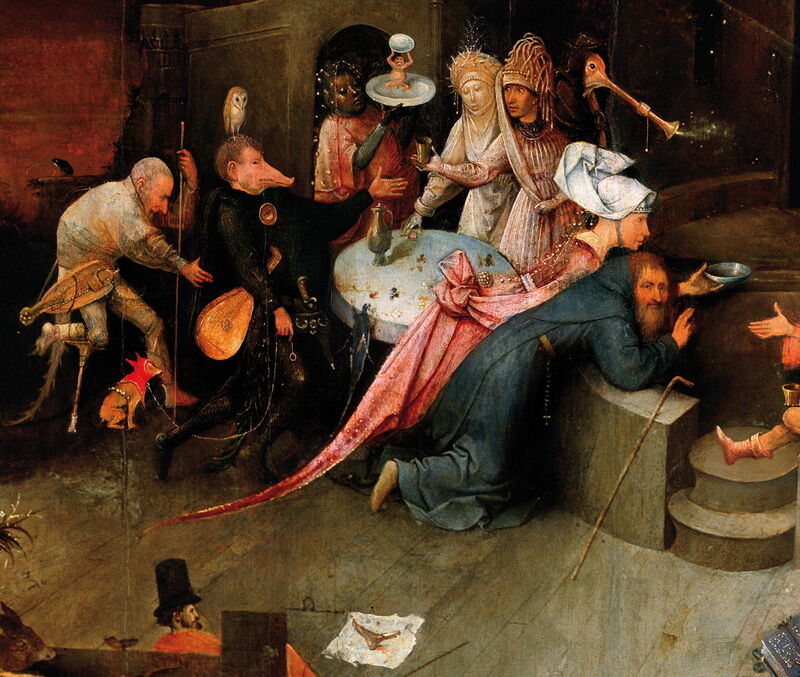 Bosch was a master of the intriguing detail. As a mark of respect for his unique artistic achievement, I offer a little tour through one of those: his signature owls. Perhaps the earliest owl shown in his paintings peers out rather timidly in his Adoration of the Magi (New York). Hieronymus Bosch (c 1450–1516), Ecce Homo (detail) (c 1475-85), oil on oak panel, 71.4 x 61 cm, Städel Museum, Frankfurt am Main. Wikimedia Commons. His Ecce Homo gives us a glimpse of another owl, at the window on the left. Hieronymus Bosch (c 1450–1516), Saint Jerome at Prayer (detail) (c 1485-95), oil on oak panel, 80 x 60.7 cm, Museum voor Schone Kunsten, Ghent. Photo Rik Klein Gotink and image processing Robert G. Erdmann for the Bosch Research and Conservation Project, via Wikimedia Commons. 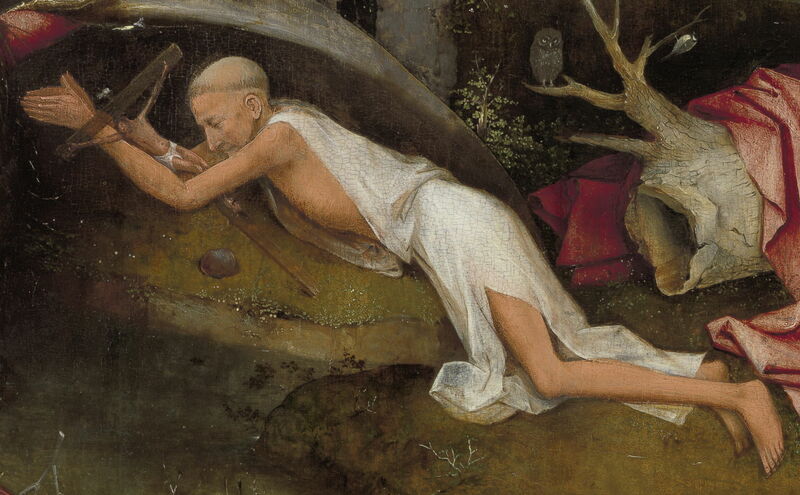 Saint Jerome at Prayer features two owls: the first is out in the open and obvious, the second hidden in the dark to the left (at the top edge of this detail view). However, I cannot find one on Saint John the Baptist (Madrid). 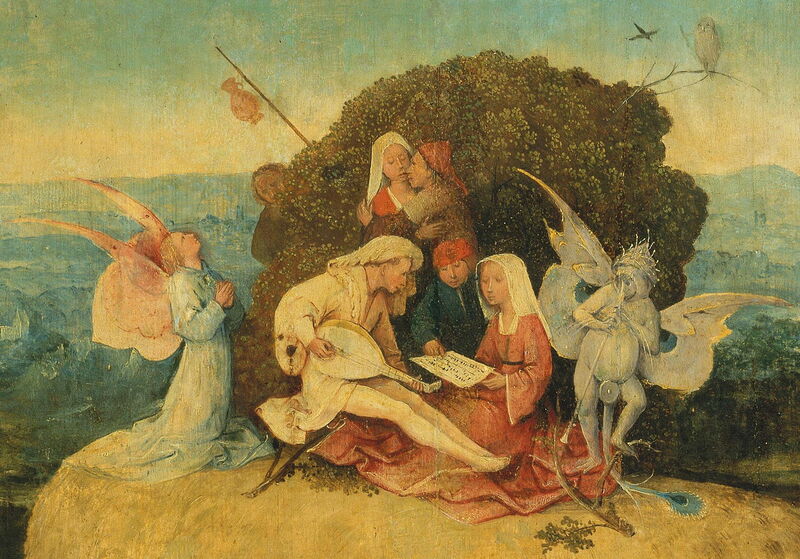 Hieronymus Bosch (c 1450–1516), Saint John on Patmos (detail) (c 1490-95), oil on oak panel, 63 × 43.2 cm, Gemäldegalerie, Staatlichen Museen zu Berlin, Berlin. Photo Rik Klein Gotink and image processing Robert G. Erdmann for the Bosch Research and Conservation Project, via Wikimedia Commons. 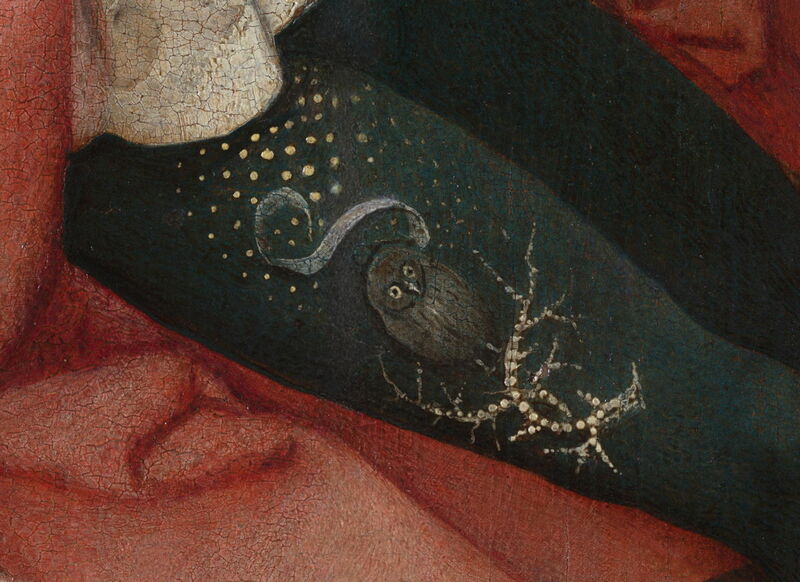 Saint John on Patmos may lack an owl, but just above his signature, Bosch shows a curious creature resembling a cross between an insect and a bird, with a human head and face which is wearing spectacles (pince-nez); this is presumably a caricature of the artist as the devil. Following that, we seem bereft of his owls in The Crowning with Thorns (London) and Calvary with Donor. 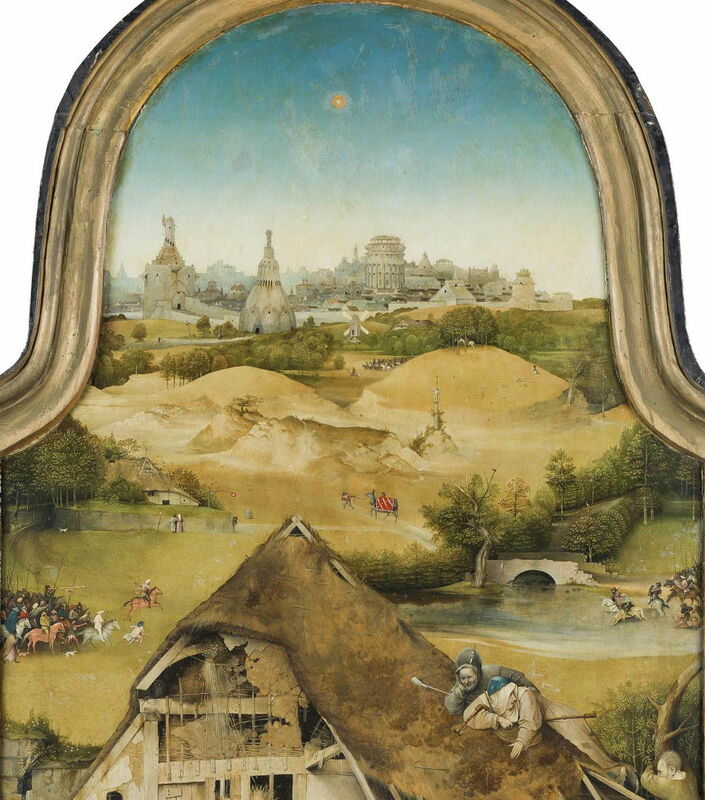 That shown in Saint Christopher (Rotterdam) is tiny, and hard to locate (it is on the tree trunk on the right of the painting). Hieronymus Bosch (c 1450–1516), The Adoration of the Magi (detail) (centre panel) (The Adoration of the Magi) (1490-1500), oil on oak panel, 138 cm x 138 cm overall when open, Museo Nacional del Prado, Madrid. Wikimedia Commons. 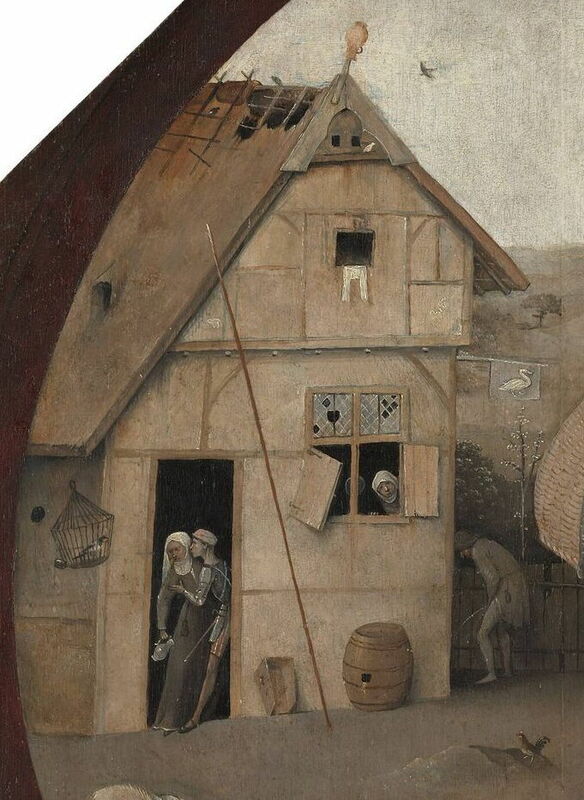 The Adoration of the Magi (Prado) includes an owl at the same level as the face of the upper person on the roof, just by the break in the wooden frame of the gable end of the shed. However, I cannot see one on Christ Carrying the Cross (Vienna), nor on the San Lorenzo version. Bosch’s major triptychs show owls in abundance: The Hermit Saints Anthony, Jerome and Giles has one in each of its three panels. Hieronymus Bosch (c 1450–1516), Saint Wilgefortis Triptych (detail) (c 1495-1505), oil on oak panel, left wing 105.2 × 27.5 cm, central panel 105.2 × 62.7 cm, right wing 104.7 × 27.9 cm, Gallerie dell’Accademia, Venice. Photo Rik Klein Gotink and image processing Robert G. Erdmann for the Bosch Research and Conservation Project. His Saint Wilgefortis Triptych has a more unusual representation, on the fiancé’s tights. The owl has been embroidered on, and has a text scroll above it, which may originally have borne an inscription. Hieronymus Bosch (c 1450–1516), The Garden of Earthly Delights (left panel, detail) (c 1495-1505), oil on oak panel, central panel 190 × 175 cm, each wing 187.5 × 76.5 cm, Museo Nacional del Prado, Madrid. Wikimedia Commons. 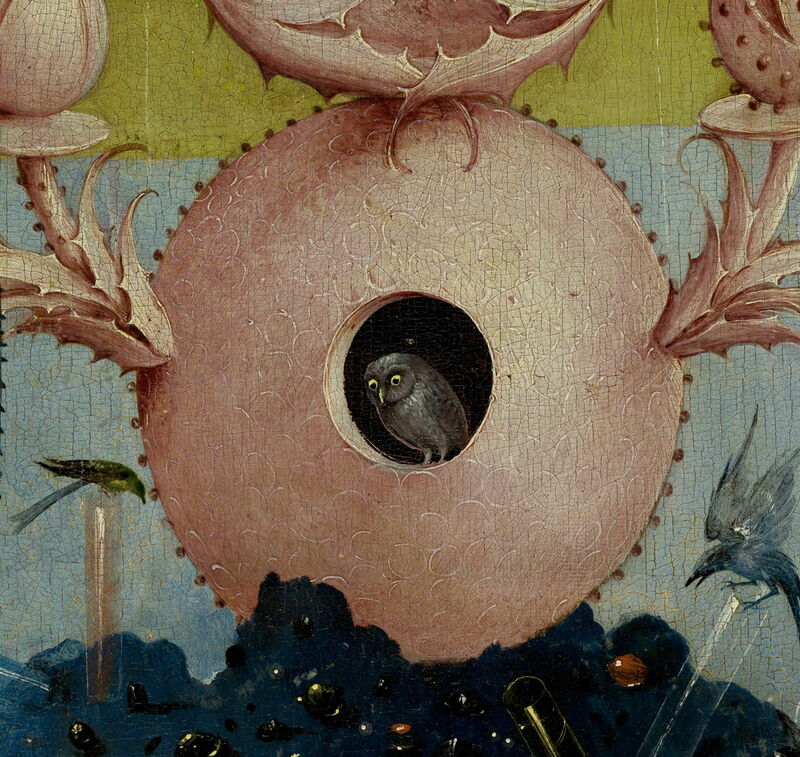 Invitably The Garden of Earthly Delights features four obvious and prominent owls, the first appearing in the porthole cut out from the base of the central fountain tower of the left panel. Another giant owl appears at the left edge of the centre panel, being embraced by one of its figures. The second owl in the centre panel is perched on top of a couple towards the right edge. It is being tempted by the offer of fruit, but does not appear interested. 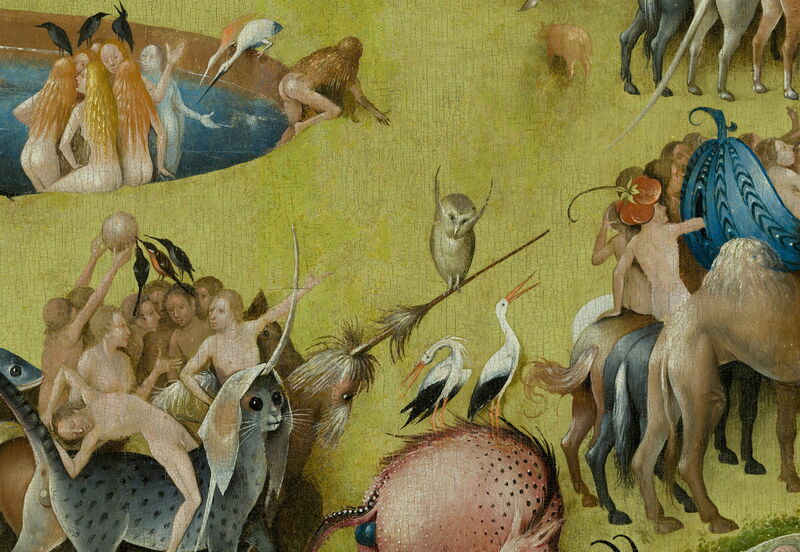 The third owl in the centre panel is perched on the ‘horn’ of one of Bosch’s fanciful creatures in the procession of animals and riders. 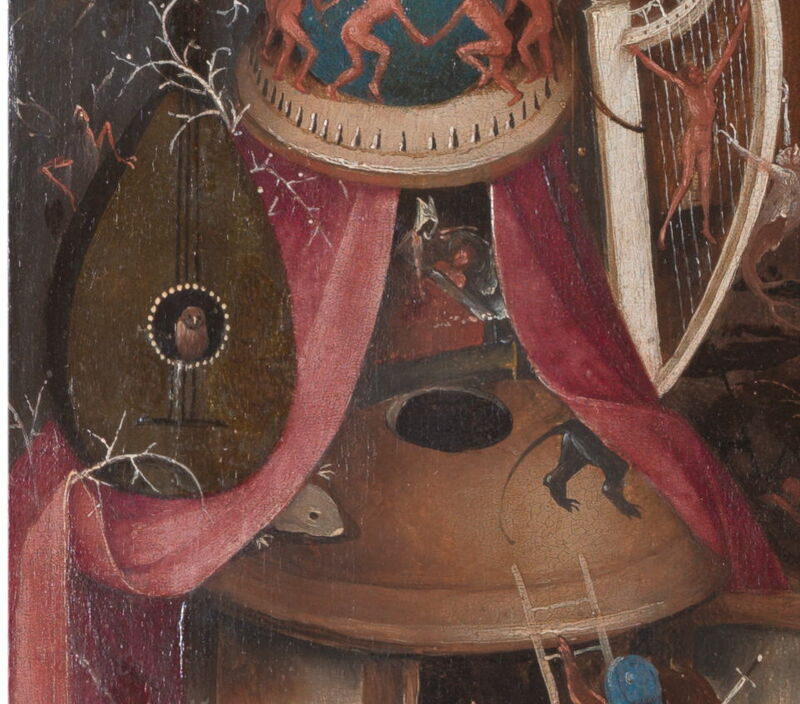 Hieronymus Bosch (c 1450–1516), The Last Judgment (centre panel, detail) (c 1495-1505), oil on oak panel, left wing 99.5 x 28.8 cm, central panel 99.2 × 60.5 cm, right wing 99.5 × 28.6 cm, Groeningemuseum, Bruges, Belgium. Wikimedia Commons. The Last Judgment (Bruges) has one, but I cannot see one in the poorer images that I have of The Last Judgement (Vienna). 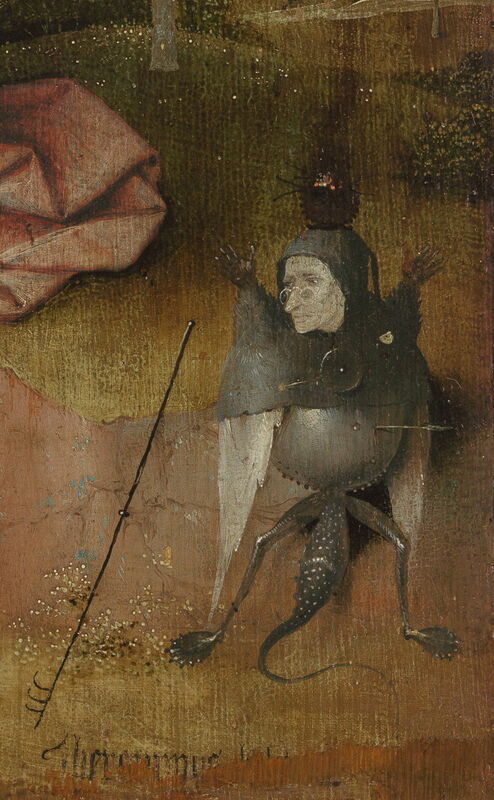 Hieronymus Bosch (c 1450–1516), The Temptation of Saint Anthony (Lisbon) (centre panel, detail) (c 1500-10), oil on oak panel, left wing 144.8 x 66.5 cm, central panel 145.1 × 132.8 cm, right wing 144.8 × 66.7 cm, Museu Nacional de Arte Antiga, Lisbon. Wikimedia Commons. 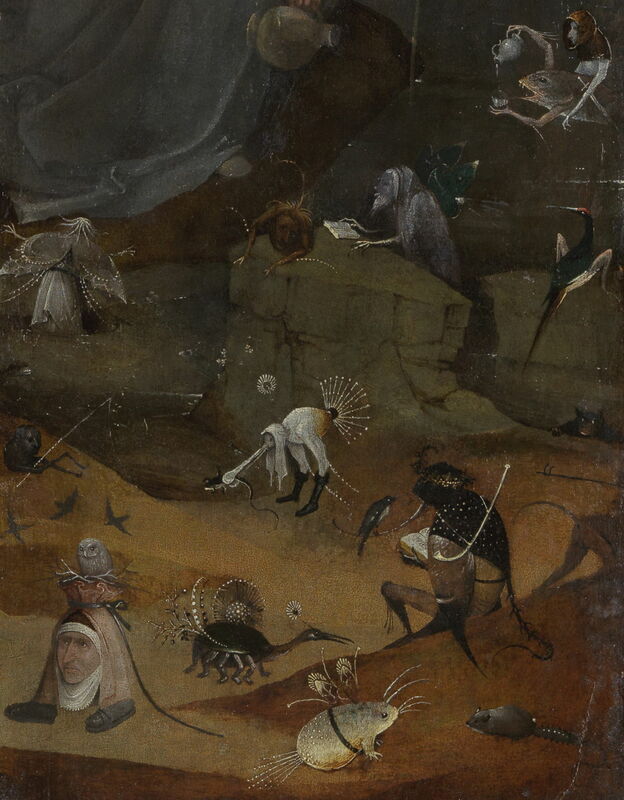 The Temptation of Saint Anthony (Lisbon) features a prominent owl. 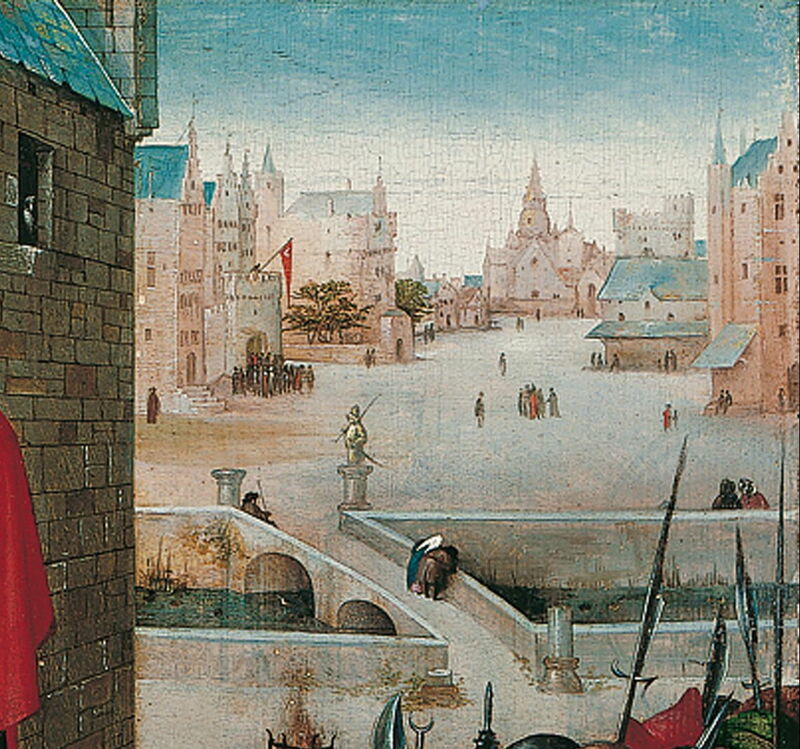 Hieronymus Bosch (c 1450–1516), The Wayfarer (exterior of The Wayfarer triptych) (detail) (1500-10), oil on oak panel, 71.3 x 70.7 cm, Museum Boijmans Van Beuningen, Rotterdam, The Netherlands. Wikimedia Commons. The Wayfarer is unusual in that both its owls are shown in the painting on its exterior: an obvious one on the tree above the traveller, and a paler creature at the apex of the roof of the brothel. However, as the centre panel is lost, there may have been more there too. There is a ghost of an owl in Visions of the Hereafter, which is hard to discern. Hieronymus Bosch (c 1450–1516), The Haywain Triptych (centre panel, detail) (c 1510-16), oil on oak panel, left wing 136.1 x 47.7 cm, central panel 133 × 100 cm, right wing 136.1 × 47.6 cm, Museo Nacional del Prado, Madrid. Wikimedia Commons. The owl shown in the centre panel of The Haywain Triptych is now quite worn, but still clear, perched above the group on top of the huge load of hay. 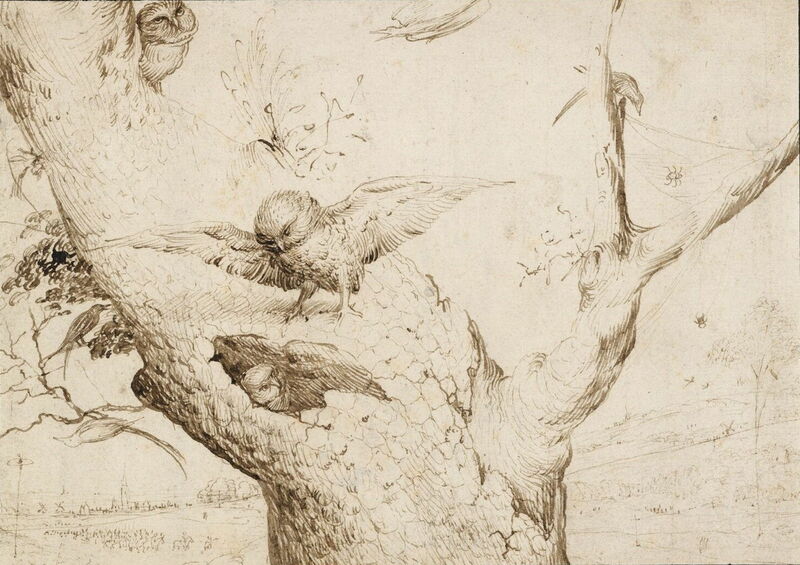 Owls also feature in several of Bosch’s surviving drawings, of which this is my favourite. Hieronymus Bosch (c 1450–1516), The Owl’s Nest (c 1505-1516), pen and brown ink on paper, 14 x 19.6 cm, Museum Boijmans Van Beuningen, Rotterdam. Wikimedia Commons. 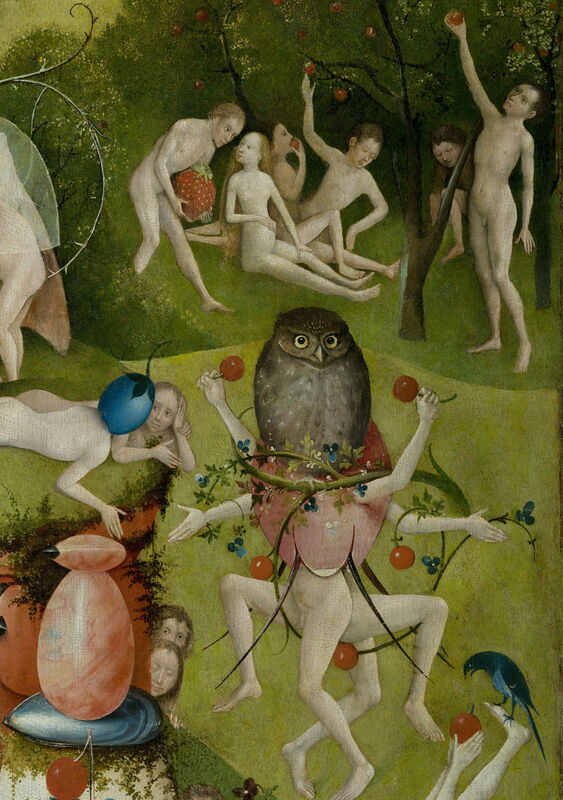 Posted in General, Painting and tagged Bosch, owl, painting. Bookmark the permalink.